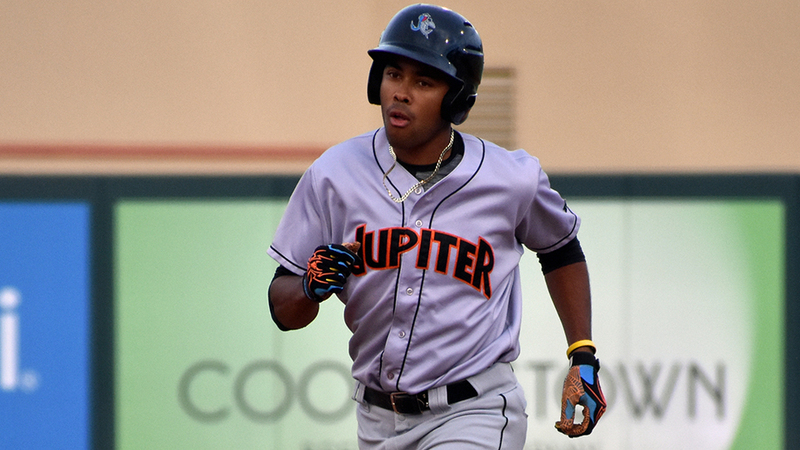 The 2019 Jupiter Hammerheads roster has been announced with numerous highly touted prospects from within the Marlins organization set to join Jupiter. In total, the Hammerheads will boast nine total Top 30 prospects according to MLB Pipeline's rankings. On the mound, the Hammerheads will carry 13 pitchers including Marlins' No. 8 prospect Braxton Garrett, No. 9 prospect Edward Cabrera, No. 14 prospect Jordan Holloway, No. 16 prospect Trevor Rogers, No. 22 prospect Will Stewart, Vincenzo Aiello, Taylor Braley, Daniel Castano, Colton Hock, Alex Mateo, Lukas Schiraldi, Chad Smith, and Tyler Stevens. Garrett, the seventh overall pick in the 2016 MLB draft by the Marlins', made four starts for Miami's former Single-A affiliate Greensboro before suffering an injury that required Tommy John Surgery. His first start for Jupiter will be his first appearance since suffering that injury. Rogers, the Marlins' first round selection in the 2017 draft, will start in Jupiter after making 17 starts in Single-A Greensboro last season. Will Stewart is both a newcomer to the Hammerheads and Marlins' organization as he was recently acquired in a trade with Philadelphia. Last season with Single-A Lakewood, the southpaw went 8-1 with a 2.06 ERA in 20 starts, holding opposing batters to a .218 average. Behind the plate, B.J. Lopez will start the season in Jupiter after playing in 36 games for the squad in 2018. The only other catcher on the roster is 2018 fourth round selection Nick Fortes. The native Floridian saw action in 19 games with numerous Marlins' affiliates. In his senior year at Mississippi, the 22-year-old hit .319 with a .435 on-base-percentage to go along with 11 home runs. In the infield for Jupiter is No. 13 prospect Jose Devers, No. 21 prospect James Nelson, Lazaro Alonso, Micah Brown, and Riley Mahan. All five of the position group finished the 2018 season with Jupiter. Mahan played 110 games donning the Hammerheads uniform in 2018 hitting .250. Devers played two games in Jupiter following his promotion in early august, however was injured and missed the rest of the regular season. Rounding out the roster in the outfield are No. 2 prospect Victor Victor Mesa, No. 21 prospect Tristan Pompey, Cam Baranek, Corey Bird, and Isael Soto. Mesa was the top international free agent in this past year's class. The highly touted prospect is ranked the No. 97 prospect in all of baseball according to MLB Pipeline and even as high as No. 60 according to Baseball America. Pompey, a second round selection in the 2018 draft, finished that same year with the Hammerheads. The Kentucky graduate thrived while hitting .297 with a .396 on-base-percentage.